Are you ready to explore the dungeon? 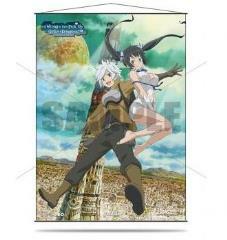 Bring Bell and Hestia home with this officially licensed Is It Wrong to Pick up Girls in a Dungeon? (DanMachi) wall scroll made with premium, silky fabric, black rods & hanging cord, featuring Bell and Hestia from the hit anime series. Ultra PRO wall scrolls are made with the highest quality with vibrant print colors, high resolution details and soft, premium fabric with silky touch. Dimensions are approximately 26.8 x 37.4 in. This officially licensed product is made only by Ultra PRO International - authenticity can be verified by our "UP" logo imprint on the rod ends.